When it’s sunny at Yester World, guests are dressed in every imaginable color. But when it rains, the predominant color is yellow. The parks are known for magic. 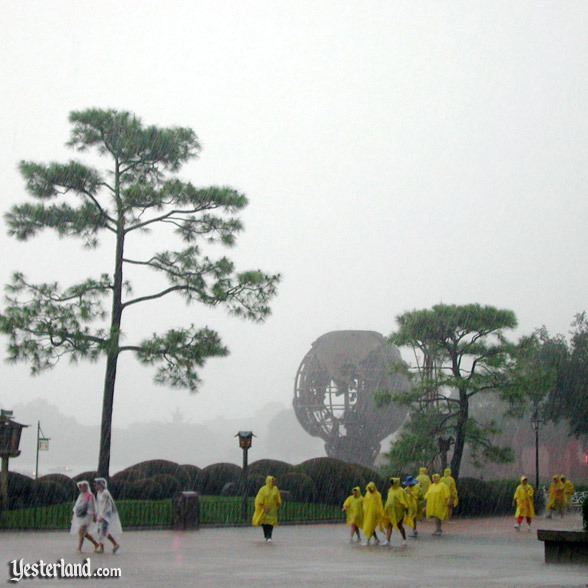 When it starts raining at Yester World, piles of neatly folded, plastic-wrapped yellow ponchos magically appear almost anywhere there’s a retail cash register. Buy a yellow poncho for everyone in your family. There are two sizes: adult and child. Each poncho costs about as much as a counter-service lunch. It beats getting soaked by the rain. Put on your yellow ponchos. Don’t let the rain slow you down too much. Time is valuable. The ponchos will keep the rain off your clothes, but if it’s a hot summer day, don’t plan on staying dry. It’s hot under the poncho, and the poncho doesn’t breathe. Your clothes may end up wet from perspiration. When the rain stops, shake the water off your poncho and put it in a bag. When you get back to your hotel room, let it dry completely. 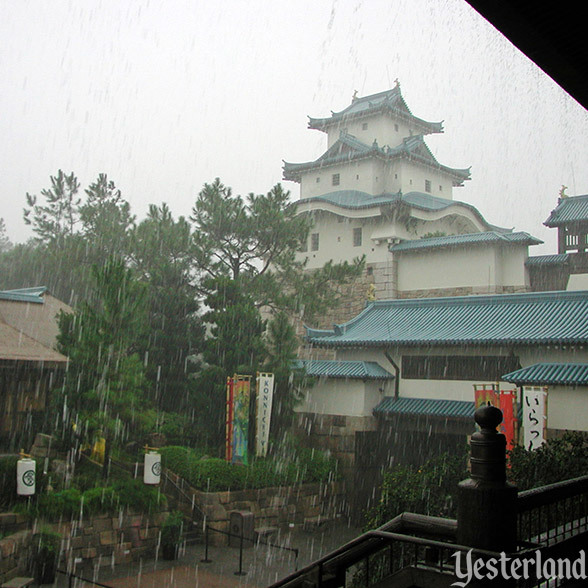 Save it for another rainy day at Yester World—which will probably be tomorrow. If yellow is not your color, consider buying an umbrella instead. Basic black is always in fashion. 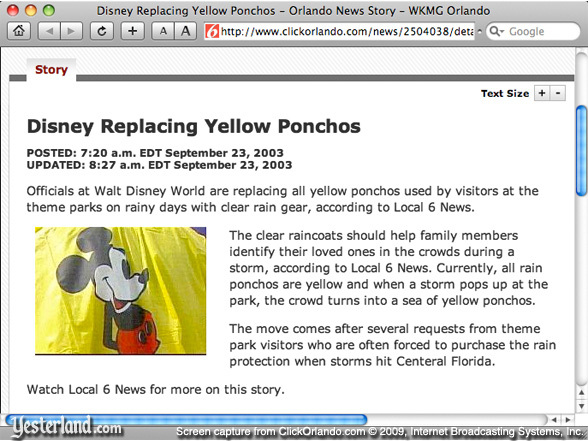 On September 23, 2003, WKMG, Local 6 News in Orlando, reported that Walt Disney World was switching from yellow ponchos to clear ponchos. WKMG Local 6 News screen capture © Internet Broadcasting Systems, Inc. The wording from Local 6 News was a bit unclear. 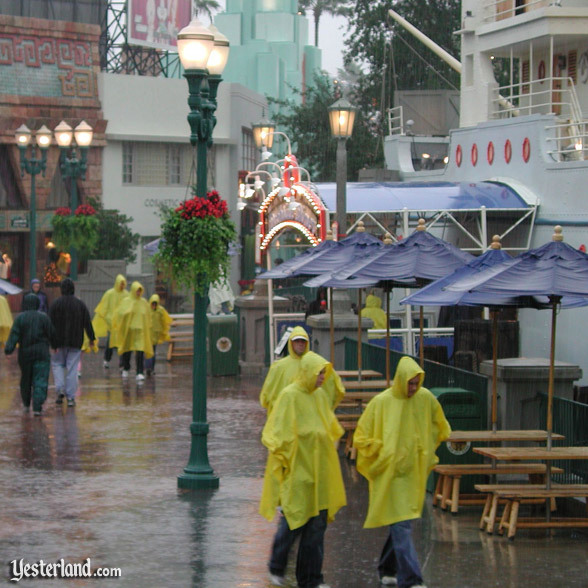 It sounded as if Disney would require guests to turn in existing yellow ponchos in exchange for new, clear ponchos—“replacing all yellow ponchos used by visitors.” But that wasn’t the case. 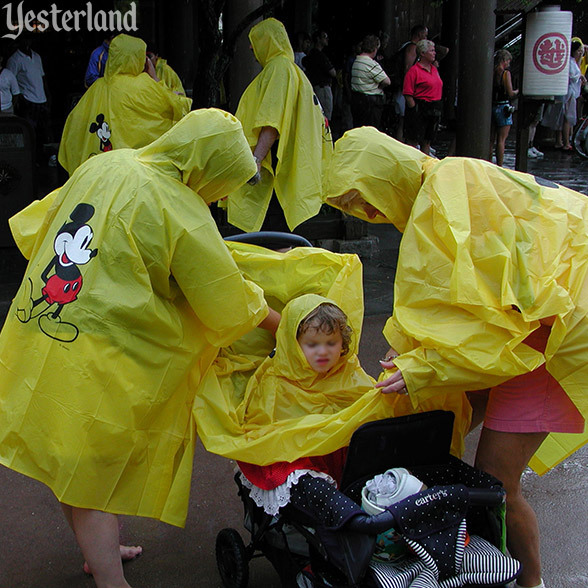 In fact, Disney’s shops continued to sell yellow ponchos, but as they sold out, transparent ponchos took their place. More accurately described as frosty than as clear, the ponchos no longer hid what guests were wearing. Undoubtedly, switching to transparent ponchos has reduced the incidence of families becoming separated. But there might be another reason. 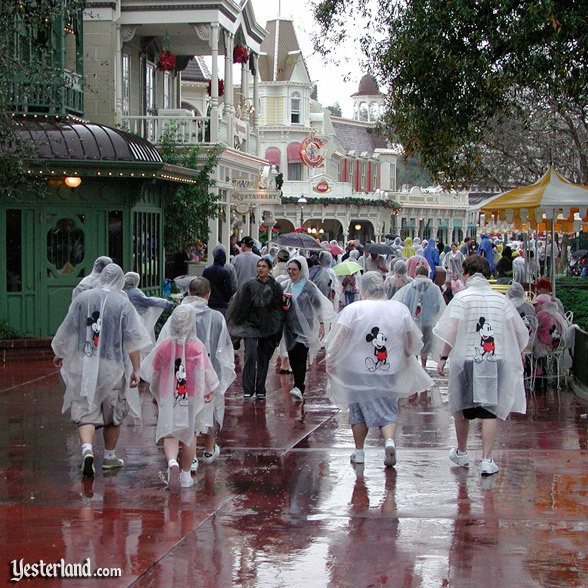 One theory is that the real reason Disney switched to clear ponchos was because there was more shoplifting on rainy days due to the ease of hiding merchandise under the opaque ponchos. 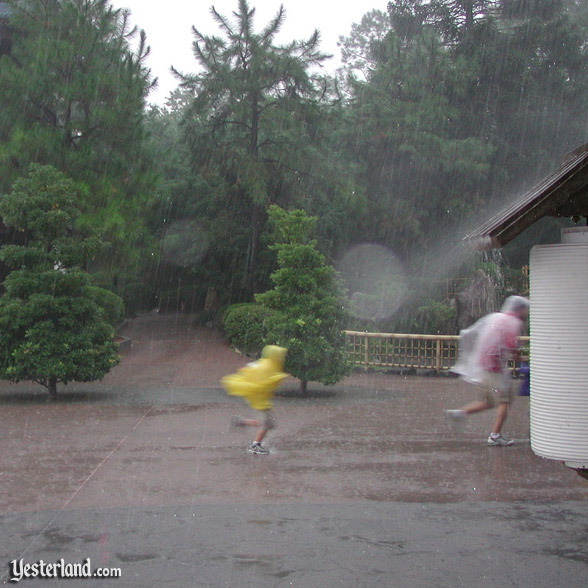 The ponchos must be a highly profitable item for Disney. This is a case where Walt Disney World has a business advantage over the Disneyland Resort. 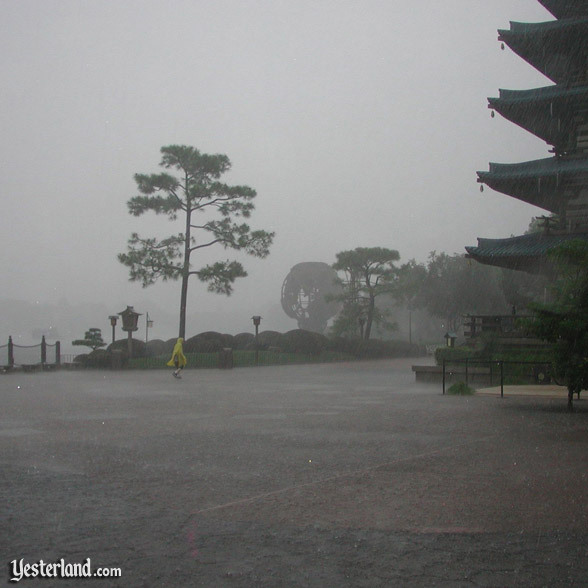 Lake Buena Vista, Florida, averages 48 inches of rain per year, while Anaheim, California, averages just 11 inches per year. In just the peak summer tourism period of June, July and August, Lake Buena Vista gets an average of 20 inches, while Anaheim gets an average of close to zero—just 13/100 of an inch. 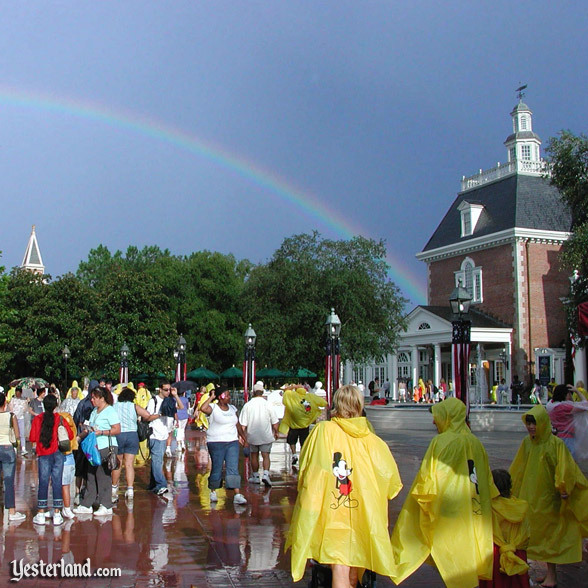 Despite the switch from yellow to clear in 2003, you can still see yellow ponchos in the parks of Walt Disney World. 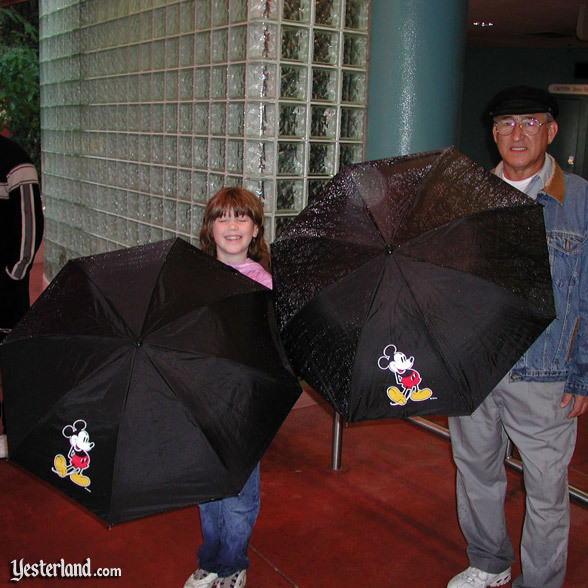 A few, with Mickey Mouse on the back, belong to people reusing ponchos from earlier vacations. These days, most yellow ponchos are from discount chains, off-site souvenir shops, and dollar stores. 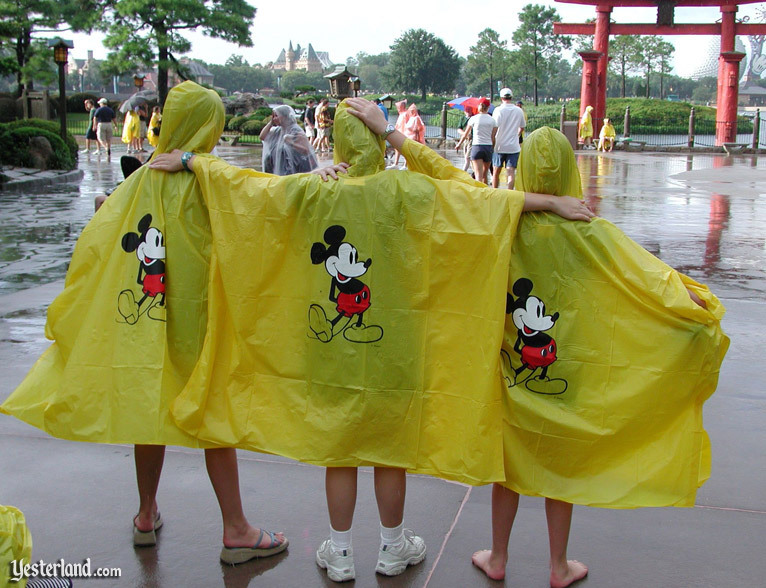 The quality is lower than Disney’s ponchos and they don’t have Mickey, but they cost a lot less—and they keep the tradition of yellow ponchos alive. Originally published May 15, 2009. Expanded April 4, 2014. Updated April 4, 2014.